This year Remembrance Day on Sunday 11th November marks 100 years since the end of World War One. It is important that as a nation we all remember those heroes who fought for our country and defined our futures. 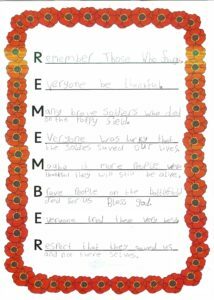 Students at Smallbrook School have been reflecting on Remembrance Day by creating poppies made out of wool, sticks and crafty fingers whilst at Forest School this week. 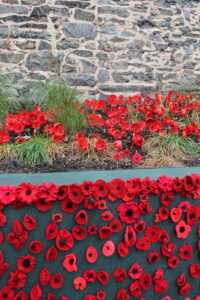 These poppies have now been featured in beautiful displays at the War Memorial in Llangollen. Many brave soldiers who died on the poppy field. Everyone was lucky that the soldiers saved our lives. Maybe if more people were thankful they will still be alive. Brave people on the battlefield died for us. Bless God. Everyone tried their very best. Respect that they saved us and not themselves. 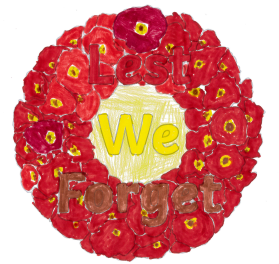 This young person also created a ‘Lest We Forget’ memorial to accompany his poem. Teachers and care staff alike are incredibly proud of these beautifully poignant creations which signify the importance of remembering those who gave so much, selflessly and who, in their 100’s of thousands, made the ultimate sacrifice for their country. Both students and teachers will take part in a 2 minute silence on Monday 12th November led by Chris, the Music Teacher playing The Last Post.